I'm always excited when I start making something at home that I used to think was either too complicated or too time-consuming to do myself. It makes me feel accomplished! Plus, I can make this flatbread for way less money than buying the store package and with ingredients I pretty much always have at home anyways. I can't quite bring myself to call this naan, although I treat it that way when I make it. 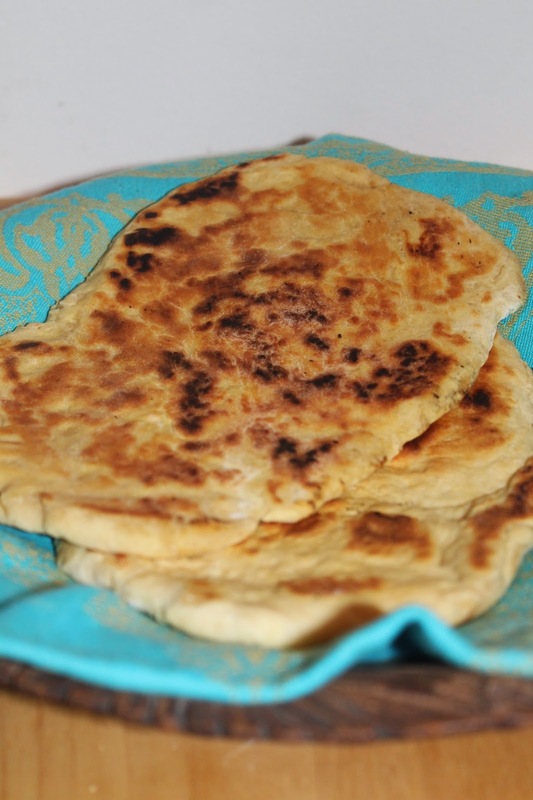 I make this flatbread when serving all kinds of Indian dishes like Stir-fried Paneer with Peppers, Chana Masala, Chicken & Apple Curry, and more. It's perfect for dipping and sopping up yummy sauces or spicy soups. I first found this recipe at Full Bellies, Happy Kids about a year or so ago and have been tweaking it ever since. I find that this recipe makes two large pieces of flatbread. Since I don't have access to a Tandoor oven, I use a very hot castiron skillet to cook my flatbread. I want to have high heat so that the bread gets brown and even charred in spots. It works great for me and it cooks up very quickly. You'll have a nice warm homemade flatbread with your dinner in (almost) no time! If you don't want the garlic flavor, you can leave out the garlic powder. This is a total comfort food dinner for a cold evening. This dish is something we've eaten multiple times, mostly with ham, but occasionally with chicken. 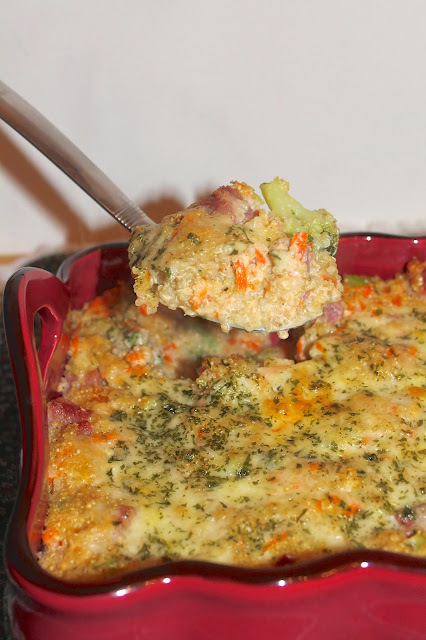 It's a versatile dish that you could use different add-ins for, but I love the broccoli + ham combination with cheddar. I originally came up with the recipe when I was cleaning out the cupboard and found some quinoa that needed to be used up, plus we had some leftover ham and frozen broccoli. I threw it all together and it was a winner. So I've tweaked it a bit and measured out the ingredients so I could share it with all of you. 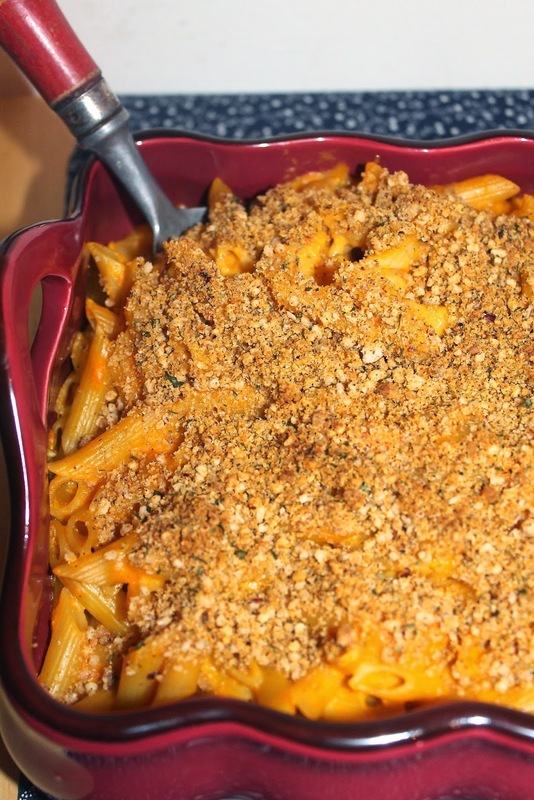 This casserole is sure to be a hit. It should serve about four people. It's a complete meal in itself, but a side salad is a nice addition. I came across a recipe for Hardscrabble Oatmeal Pancakes in this old Colonial Cookbook recently. Since I love pancakes so much, I had to give them a try - plus I was intrigued by the molasses sauce. 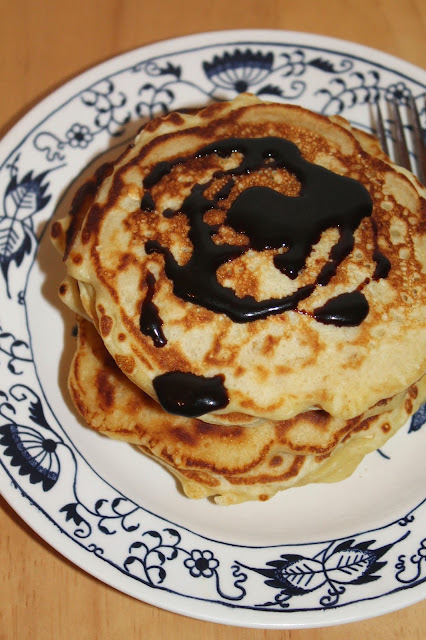 These pancakes are "hardscrabble" in that they don't have any bells and whistles - they are just an old-fashioned oatmeal pancake that uses molasses instead of maple syrup. We are trying to eat both healthy and frugally lately as sometimes our food bill is insanely high for just two people. So I like meals like these where most, if not all, the ingredients are pantry staples. Also - exciting news - this past weekend we finally located and saw a snowy owl! I was so excited! While we aren't super into birding, we do like to see birds when we have a chance, especially rare and/or exciting ones. Most of the time when I go somewhere for the purpose of seeing a bird, I get skunked - including a few times last winter when going to find a snowy owl. This owl was so beautiful and white; it looked perfect against the falling snow. We couldn't get too close because it was on private property and also we didn't want to scare it. It looked great through the binoculars. This is the best photo I got. Well folks, it's the last week of 12 Weeks of Winter Squash! 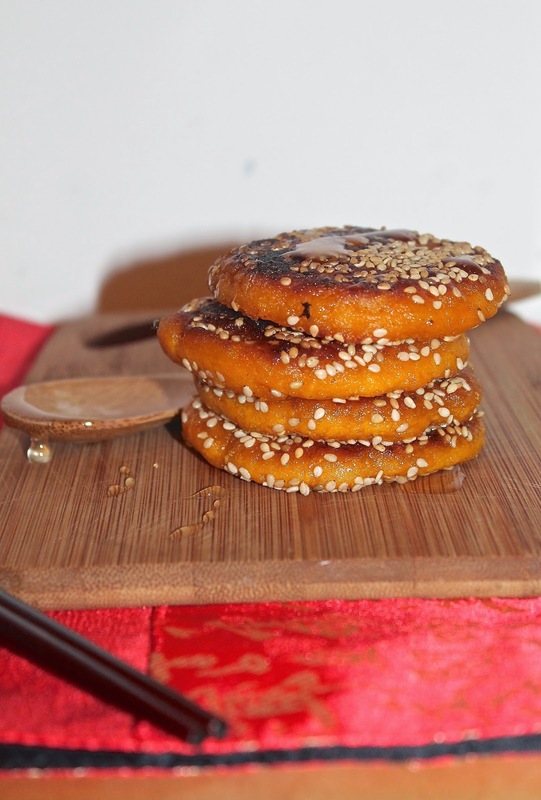 I think this was the third year I participated in this event and this is the first year that I posted a new recipe for every week! That was my goal because we have so many (so many!) winter squash from a great deal we got at the last day of our local farmers' market and then a bunch we got from a relative's garden. Luckily, they keep so well and this event has really helped me to make sure I don't forget to use them. This year I've used all kinds as well: butternut, blue hubbard, spaghetti, delicata, heirloom sweet meat, acorn, kabocha, and of course pumpkin. And, we still have more in the basement and a bunch of puree in the freezer, so I'm not finished with winter squash for the season just yet! 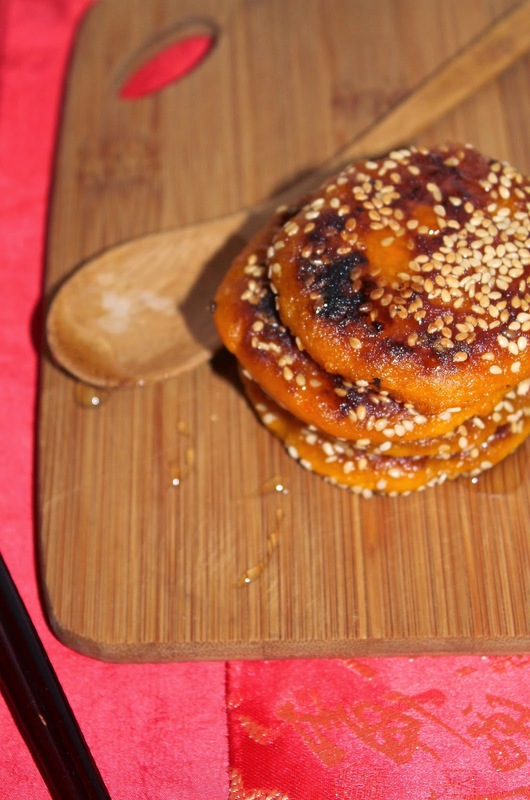 This week I'm using kabocha squash one more time. 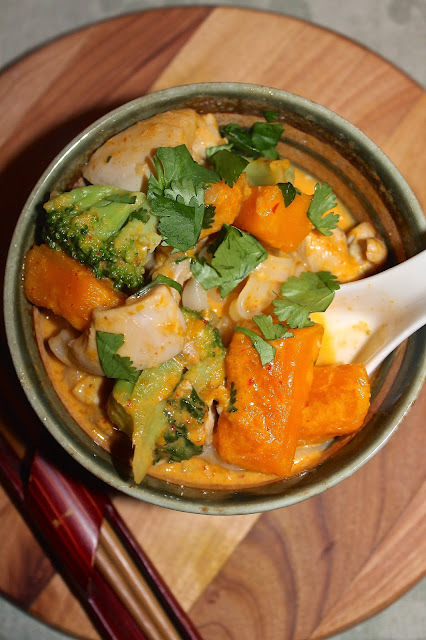 I love the way the sweet kabocha squash pairs with the spicy red curry in this dish. I added broccoli, but you can use almost any vegetables you have on hand - snow peas, green beans, bell peppers, etc. Curries are so versatile and forgiving. This dish will serve four people. Today I'm officially kicking off the 25 Pies of 2015 challenge I created for myself at the end of 2014. I've decided that the definition of pie here will include both sweet and savory fillings. I have this old Colonial Cookbook that has some really interesting dishes in it and one that caught my eye for this challenge was Onion Pie. I made some slight modifications because the original recipe was for a deep dish double crust pie. 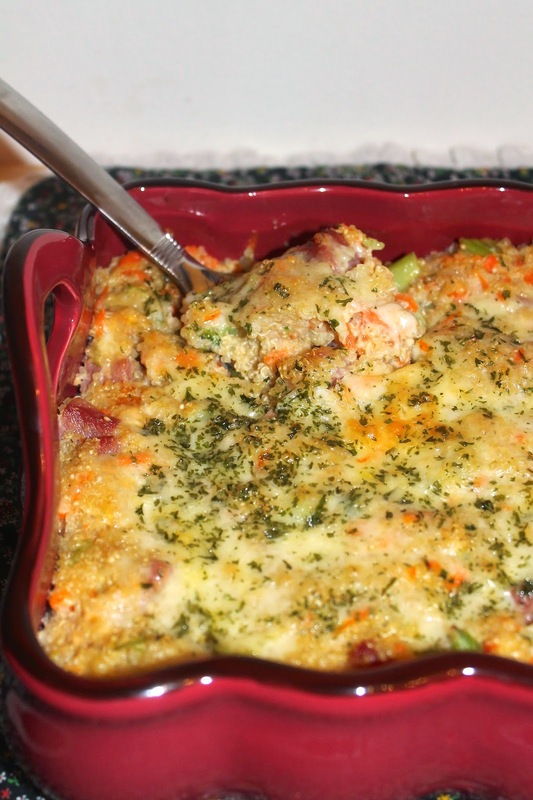 The filling is really very much like a quiche - eggs, cream, and some flavorings. 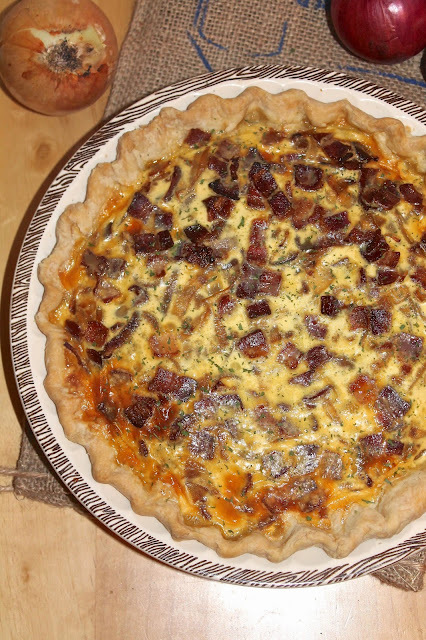 However, there are a lot of onions in here and they really are the star of this pie, not the eggs. There are two pounds of caramelized onions in this pie filling! We ate this pie for dinner and it's a perfect meal with a side salad. It would also make a lovely lunch, breakfast, or brunch. It should serve between four to six people depending on the side dishes and how hungry they are. There was not a specific recipe for pie/pastry crust given in the book, but you definitely want one that isn't sweet. I used my olive oil pie crust for this dish because it's savory and quick. I've got a long list of pies to try this year and am looking forward to perfecting my pie crusts in terms of technique and flavor, but also in making them look pretty! The wind chills and snow are hitting us hard lately here in western NY! I actually had a snow day from my regular job this past Friday. That means it's time for comfort foods that warm up your belly and soul. Butternut squash mac n' cheese is something that I used to make rather frequently, then I didn't make it for a couple of years (not sure why - maybe because I was making so many other kinds like this and this and this). Surprisingly, it never ended up on the blog until now. So for the 11th week of 12 Weeks of Winter Squash, I'm finally posting it! To make it even more delicious, I've added a hazelnut crumble topping. We do like to go out and snowshoe, hike, and birdwatch in the winter, but lately it's been just too cold and so bitterly windy that we have been laying low in our free time. That means warm blankets, knitting, too much Netflix, steaming mugs of tea, and warming comfort food. When I make mac n' cheese, it's usually the main course for our meal. A side salad helps round it out a lot. This dish will serve about four to six people as a main dish. Also, I recently got a smartphone (for the first time ever!) and am finally on Instagram - it would be awesome if you would follow me (and I'll try to follow you back). You can also find me on Facebook and Pinterest. It's already Week 10 of 12 Weeks of Winter Squash! I have been trying to get a recipe posted for every week of the event because we have so many winter squash in the basement and a variety of kinds. This event helps me to not only use them up, but makes me come up with new ways to use them because I already have a lot of winter squash recipes posted. So far I've been successful in getting a new recipe ready for each week. This recipe is inspired by this one that I've been interested in trying. After several unsuccessful tries to find glutinous rice flour at a few different stores, I found sweet rice flour at an Asian market around the corner. It worked and they were delicious! We ate these as an appetizer to orange chicken and rice. I did not make these as sweet as the couple of recipes I read. They were still plenty sweet, especially with a drizzle of honey. They'd also be a fun dessert. They are crunchy on the outside and creamy and sweet in the middle. 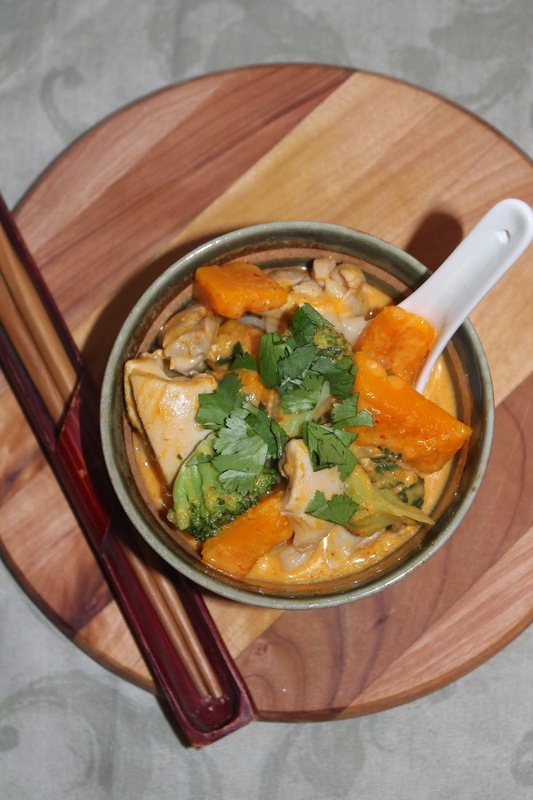 Kabocha is one of my favorite winter squash - it's so colorful, sweet, and dense. Ever since I saw this Pumpkin Pizza Dough recipe, I've been very intrigued by the idea of incorporating winter squash puree into a pizza dough. So for Week 9 of 12 Weeks of Winter Squash, I finally did it! I was surprised by how nice the pizza dough turned out - I thought the puree would make it too wet or difficult to work with, but that wasn't the case at all! It turned out perfectly. You can't really taste the pumpkin/squash flavor in it, but it adds a depth of savory flavor to the crust. For a first try, I stuck with a cheese pizza to see how the crust tasted, but now I think you could put pretty much any pizza toppings on it that you'd like. This dough recipe will make two 10-11 inch pizzas. The pizza recipe is also for making two pizzas. I think the dough would also make terrific breadsticks or dinner rolls - something I will likely try in the future. Also, you can use pretty much any cooked and pureed winter squash in this dough. I used Long Island Cheese Pumpkin because we have so many, but others like butternut, regular pumpkin, hubbard, etc. would work as well. I used homemade pumpkin puree, but canned is perfectly fine.